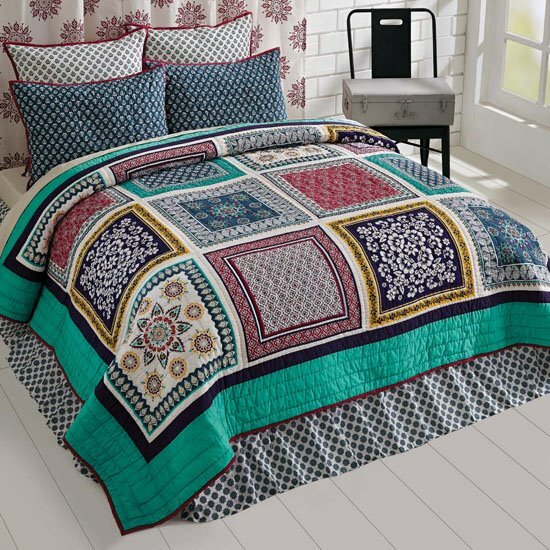 Mariposa Quilt Bedding and coordinates by VHC Brands | P.C. Fallon Co.
With a look that is somehow both vintage and perfectly on-trend, Mariposa features handkerchief-like blocks of designs in vivid colors of teal green, pink, turquoise, fuchsia, eggplant, and indigo blue. A variety of prints are combined masterful ease, including medallion prints, ditsy prints, florals and paisley prints. Quilts are machine pieced and hand-quilted in echo and channel patterns. Coordinating pieces are offered in several color ways, making it easy to achieve a completely custom designer look by choosing fuchsia, indigo or turquoise. Shower curtain uses an enlarged version of the same medallion print used in the bed skirt. Mariposa pieces offered include quilt sets, pillow shams, Euro shams, king shams, shower curtain, bed skirts, and window treatments. Imported. Machine wash in cold water on gentle cycle. Mariposa Fuchsia Short Panel Set of 2 63"x36"
Mariposa Indigo Short Panel Set of 2 63"x36"
Mariposa Turquoise Short Panel Set of 2 63"x36"
Mariposa Fuchsia Panel Set of 2 84"x40"
Mariposa Indigo Panel Set of 2 84"x40"
Mariposa Turquoise Panel Set of 2 84"x40"